If you’ve ever ogled over a seemingly perfectly trained or wellmannered dog, the first thing to know is that the dog’s behavior wasn’t developed overnight. Happy, sociable, well-mannered dogs aren’t born that way — their demeanor reflects patient, consistent training techniques. The good news is that this process is within your reach and can be a lot of fun. With the right approach, attitude, and training tools, raising a puppy or training an adult dog can be a fascinating learning experience. If a dog impresses you and the handler seems approachable, compliment them and ask how they ended up with such a lovely companion. Dog lovers cherish their bragging rights; if they live in your area, you might discover a good school, technique, or trainer to help you. When we began our careers, you didn’t see much variety in training tools beyond a metal chain collar and 6-foot leash. Nowadays, shopping for your dog is as much fun as taking a child to the candy store. The toys are colorful, noisy, and creative. In the collar and leash section, lengths, style, and colors abound. Most excitedly, training sections contain gadgets, devices, and equipment to aid everyone and any dog, regardless of age, personality, or learning capacity. The joy of new-age training tools and gadgets is that many of them assist your dog’s learning ability, thus considerably shortening the time it takes your dog to learn a new behavior. It may take weeks for a puppy to associate sitting with your repeated direction, although it will take only minutes to associate a clicker sound with a tasty reward (see Figure 10-1). Figure 10-1: Use the clicker to highlight moments when your dog is relating to you. Always follow the sound of a click with a food reward. Different pieces of training equipment affect your dog’s learning and can shape how she relates to and associates with your direction. 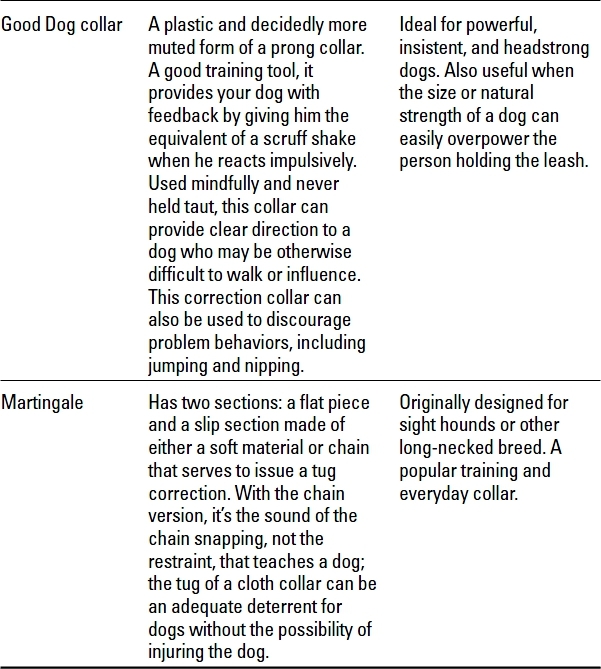 For example, a proper teaching collar is meant to condition cooperative behavior or to discourage incorrect responses. Table 10-1 helps you choose the collar most appropriate for your dog’s personality, size, and temperament. Just like collars, many types of leashes are available, relating their use to both how they can accommodate you and what each communicates to your dog. Table 10-2 outlines popular options. The average daily walk is an excellent example of how things get misunderstood between our species. When an uneducated dog pulls a person by her leash, the person often mistakenly assumes that the dog is stupid; otherwise, she wouldn’t choke herself. The dog (rarely dumb) is learning a very different lesson, however: that being near their person is asphyxiating. The more she pulls to get away, the greater the restraint and the more determined she is to break free. If this dog should escape, she’ll have little to no incentive to return. 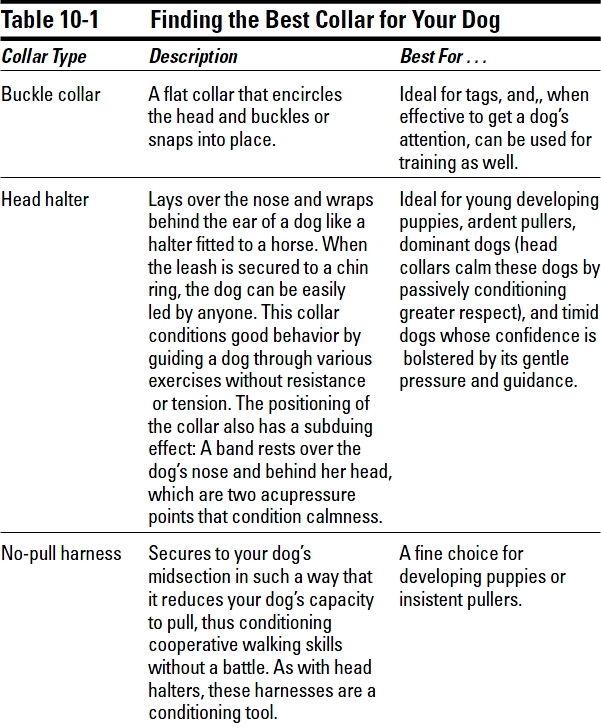 Use this chapter to discover an effective training collar and Communicating with Your Dog or Happy Training, Happy Tails to discover more appropriate techniques to teach your dog to follow your lead. Retractable leads can cause incidents when used near roadways or in crowded situations. Less controllable than a standard leash, a retractable lead can malfunction, leaving the handler out of control. If your dog chews through cloth or leather leashes, you can use a chain leash to eliminate the habit. Once your dog is unsuccessful in chewing through the chain, her determination to chew any restraint should be cured. However, chain leashes are heavy and can cut your hands if you’re trying to restrain a very active dog with one. If your dog chews through cloth or leather leashes, you can use a chain leash to eliminate the habit. Once your dog is unsuccessful in chewing through the chain, her determination to chew any restraint should be cured. 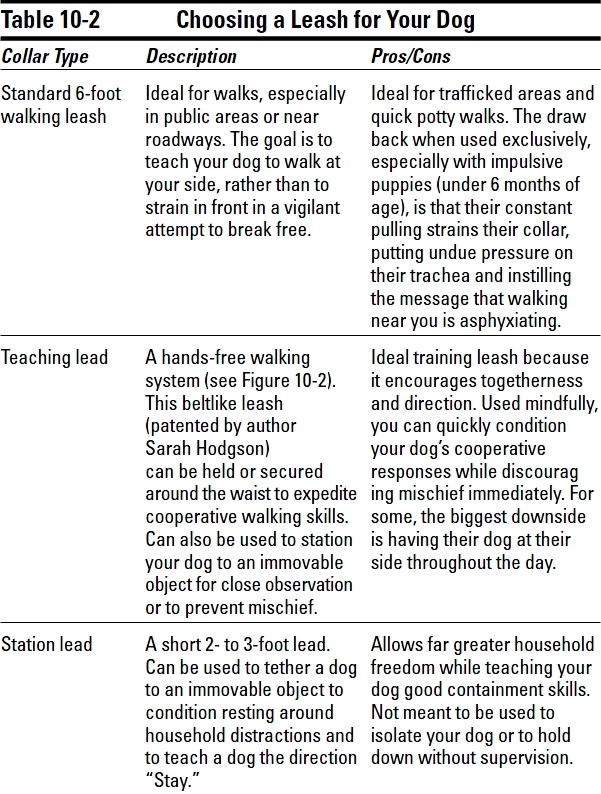 However, chain leashes are heavy and can cut your hands if you’re trying to restrain a very active dog with one. 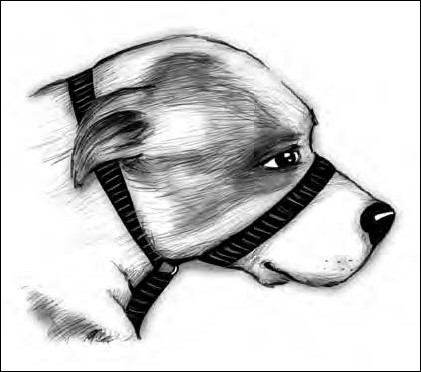 Figure 10-2: On a teaching lead and a head collar, this dog is a much more cooperative and cheerful companion. The clicker is a small handheld device that, when depressed, issues a sharp clicking sound much like a louder version of the sound of a shutter camera. When this sound is paired with a food reward, an association occurs, causing the sound itself to become rewarding. When highlighting desired behaviors, the clicker speeds up your dog’s learning and amplifies her enthusiasm for the training process. Why is the clicker such an effective training tool? The sound is sharp and distinct — different from any other sound heard during a normal day and meant just to signal a reward. Purposely tied to a treat, this sharp sound highlights what is to come when it’s perfectly timed to reinforce a specific behavior. Once your dog learns the behavior, she’ll achieve what every dog dreams of: the power to control you. But this time, she’ll be controlling you with perfect, praiseworthy routines. Clicker training is most effective for those dogs who are food motivated and for people who are organized enough to apply the technique either throughout the day, on an outing, or during organized lesson times. Though the ideal is to use the click-treat association all day every day while conditioning learned associations, few people have that presence of mind. Still, the clicker is an effective tool, even if used with only periodic regularity. 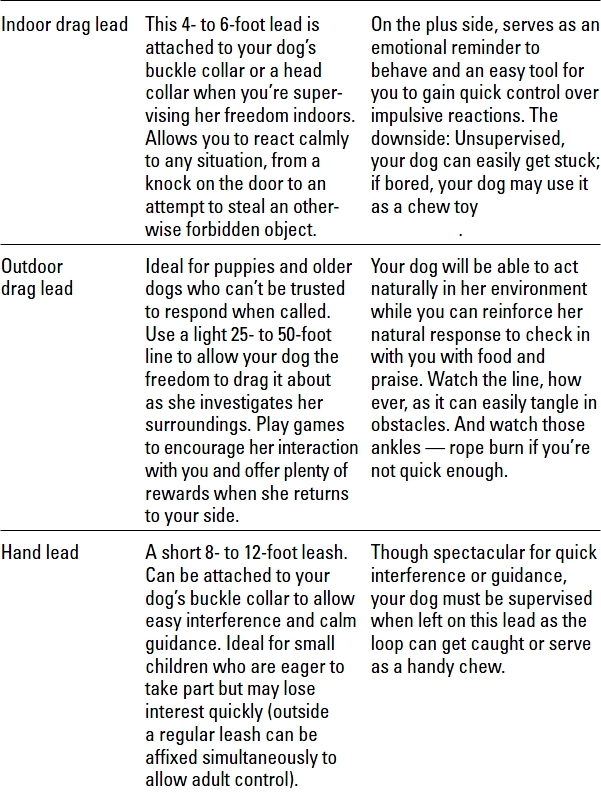 You can use the clicker to shape every behavior from simple directions, such as “Sit” and “Wait,” to complex routines like housetraining and tricks. When using the clicker, pair each individual click with a food reward, timing each click to the moment your dog hits a position or finishes a sequence or behavior. Table 10-3 lists several ways to use the clicker-reward system. The purpose of the clicker is to highlight the moment your dog responds correctly, not as a command to actually trigger a behavior. For example, if your goal is to have your dog come when you call, click and reward when she’s at your side, not when she’s a distance from you. Though she may come initially in response to your click, she’ll lose interest over time. You can also use the click-reward system to highlight good behavior, such as good chewing, greeting, or housetraining habits. To do so, either keep a clicker and treats with you at all times (wearing a fanny pack is a good idea because it saves on soggy-treats-in-thelaundry mishaps) or place several cups around the house with ready clickers and treats. Each time your dog is chewing an appropriate toy, behaving well with children or other pets, greeting others respectfully, or eliminating in the right location, click and treat her. Although nothing is as exhilarating as seeing your dog make a quick clicker connection, it’s important to orchestrate its disappearance lest you or your dog become clicker dependent. If you think of your dog’s brain as a blank CD, you’ll note that your interactions create behavioral memories that are replayed again and again. The use of the clicker simply speeds up your dog’s association and memory for chosen words and/or signal cues. Once this process is completed, however, you need to phase off both the sound of the clicker and the reward so that you’ll be able to call up these responses simply by word or visual prompting. The best approach is two weeks on, two weeks to phase out. During the first two weeks, use your clicker to highlight a chosen behavior or behaviors, such as housetraining or teaching your dog to “Sit.” Each time she successfully responds, click and reward her. After two weeks of focused reactions, begin to phase out the clicktreat response intermittently: Click-treat every other time, then every third repetition, and back to one for one so that your dog doesn’t know when she’ll be rewarded with a click-treat response. Continually reward your dog with verbal praise, petting, or playful interaction to ensure her continued enthusiasm. During this twoweek period, begin to eliminate the clicker response entirely so that you’re able to direct her without food or a sound reward. Promote good household manners or confidence with unfamiliar people or settings, chiefly by teaching the dog where to stand or sit during meals, quiet times, and doorbell greetings. Aid advanced obedience lessons, agility exercises, and household manners by placing the disc at greater distances from the handler. If the dog is taught to nose the disc, it may be hung on furnishings or attached to persons to teach behaviors such as closing an open cabinet, approaching a person, or nosing a ball. Aid a dog in more complex training sequences, such as those associated with agility. Help a dog overcome fears or phobias, as experienced with people or objects (street grates, unusual objects). Point training: Like targeting, this technique applies a stationary lure to help a dog move to where the handler wants him, thus the dog can be used to indicate a specific person or a particular location that the dog should approach. Initially paired with a food reward, a dog is taught the pointer can ultimately be replaced by her handler’s index finger. Although the reach of the finger may be shorter than a target stick, it’s always handy and can be used to signal basic training exercises. Snack packs: Use a fanny pack or an otherwise designated pouch. Fill it with treats and a clicker if you’re utilizing one. Use it as described throughout this book, but especially to condition your dog to interact politely. If your dog barks, jumps, or paws at you for a reward, ignore her. Only reward good manners, such as sitting calmly in front of you or chewing on a toy or bone. Where does your dog’s heart lie? Ask two friends (whom your dog knows) to stand 10 feet apart. Give one a cup of treats and the other a favorite toy. Bring your dog into the room and have them simultaneously try to lure and then reward her. Repeat this exercise three times. 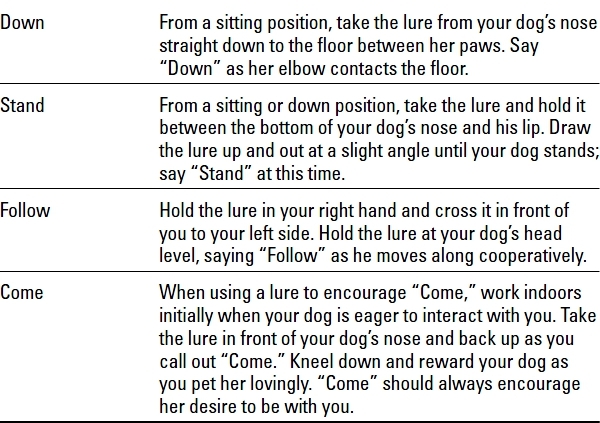 Take the chosen reward from the last exercise and now ask the other person to simply kneel down and call to your dog sweetly, rewarding her with affection when she responds. Repeat this several times. Prioritize your rewards, using the most attractive one for difficult sequences, but using the others intermittingly or when applicable to mix it up. Dogs, like people, love rewards; however, different things motivate each dog. Some dogs will do back flips for a flake of cereal, while others demand chopped liver. Some love a toy above all else, while others (though rare) are justly satisfied with quality attention. If you’re on the fence about using treats to condition your dog’s good behavior and responsiveness, it may help to know that you’ll not be using treats forever. Food is initially offered to help your dog understand your direction. Think of it less like a bribe and more like a positive reward to highlight good behavior, or perhaps simply pay for a job well done. Once a particular direction is understood, you can phase out treats and replace them with petting and verbal praise. Rank toys and treats. If your dog will sit happily for a Cheerio but does back flips for dried liver, set aside this high-ranking snack for more difficult behaviors, such as coming outside or ignoring a temptation (for example, another dog). Rank toys with the same focus on finding one that trumps all others. If you’re averse to using treats or your dog simply doesn’t like them, you’re not alone. There are many theories of dog training, and the first thing to note is that they all work to some extent and also reflect the attitudes and beliefs of the trainers. If you’d like to use praise or toys to motivate your dog’s cooperation instead of treats, then do it with gusto, selecting a word to highlight the moment your dog cooperates. However, the psychological research is quite clear, suggesting that food works faster and is easier for inexperienced trainers to use. Introduce your dog to one new word or sequence at a time. Say the direction as you lure your dog into position with a treat or toy. If your dog is confused, stop saying the direction and simply concentrate on luring him into place. After he moves into position reliably, say the word the moment he cooperates. In addition, say the direction anytime you see your dog moving into the position naturally. For example, if you’re working on “Down,” say it anytime you see your dog lying down naturally. Praise her verbally or with loving attention. Show family members and friends how to give your dog direction and prompt good manners, providing everyone with treats and toys, so that your message transfers. 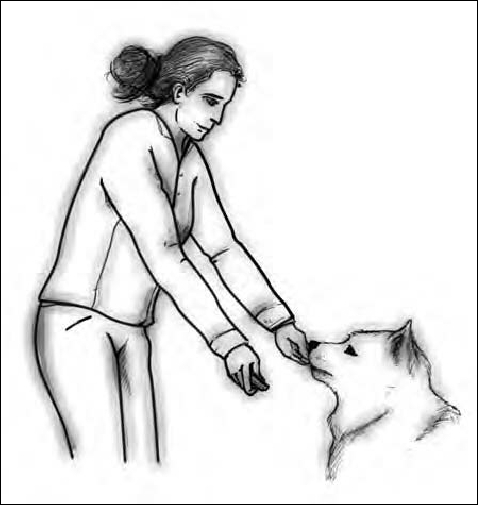 As your dog show signs of learning a command – for example, moving into the down position quickly and without pause or confrontation – over-exaggerate a hand signal that will enable you to direct your dog visually as well as verbally. Phase out treatdependence as you stagger your rewards so that they come every other response, and eventually in an irregular pattern. Keep up the praise and verbal appreciation. If you’re using a clicker, pair each click with a food reward. After a behavior is learned, you may phase out the clicker by using it only intermittently. Though you can use food without a clicker, don’t click without a food reward, lest the sound lose its dramatic influence. Once your dog has learned a direction, reward her intermittently. This system keeps her attention sharp, while highlighting the verbal direction over the reward. The timing of your reaction can help or hinder your dog’s learning capacity. To understand this concept, ask someone to toss a ball into the air. Mark the moment the ball reaches its highest mark by saying “Yes” or by depressing a clicker. Repeat this exercise until your timing is perfect. Now relate this exercise to your dog’s capacity to understand your desire: If you’re trying to teach your dog to sit versus jump, you’ll want to mark or click the second her bottom hits the floor. Your reward will guarantee a repeat performance. On the other hand, if you mark the moment she jumps, she’ll just as willingly repeat that behavior instead. A few other training tools, namely the clicker and the snack pack, are especially useful in this process and can accelerate your dog’s behavioral memory. (See the section “Choosing Training Tools and Gadgets,” earlier in this chapter.) With this method, you may use food to motivate your dog’s cooperation throughout the day. Over a two-week period, you can gradually phase out treating for every correct response. Because your dog will be unsure when the food reward is going to be offered, his attention will remain sharp. Don’t forget to praise him each time, though. Regardless of your dog’s priority, the Reward System works by increasing your dog’s focus on the learning task and the speed at which she can identify your intention, and linking it to a specific word or signal. If the goal is to have your dog “Sit” or “Potty” when directed, then you must offer a reward when your dog acts appropriately. You should also reward your dog based on his personality type. Some dogs are assertive because of their breed (see Interpreting Your Dog’s Breed-Specific Traits), while in others it’s an individual personality trait (Identifying Your Dog’s Individuality). In each litter of puppies, one or two puppies are generally bossy and controlling by nature. These puppies bring the same level of intensity into their human family. How can you tell whether you have a dominant puppy? If your puppy ignores or defies you often, stands in your way, or goes to great lengths to control situations (from greeting visitors to disrupting your quiet time), she’s exhibiting a dominant personality. Use a fanny pack filled with treats to center your dog’s focus and encourage her to accept direction as a positive interaction, instead of issuing corrections, which are perceived as confrontational. Teach your dog “Excuse me” by moving her out of your way when she’s in it. There’s no faster way to remedy her delusions of grandeur than to remind her constantly that she needs to be more mindful of where you are, versus the other way around. Design a lesson plan (see Happy Training, Happy Tails) to highlight the directions most essential to your day. Reward each cooperative response. If you’re using food rewards, consider employing a clicker as well. Once your dog is responding eagerly to your directions, involve other family members. Chaperone children, using a leash to enforce a respectful reaction to each direction. Though your dog’s response to the direction “Come” is not the be-all or end-all of the training process, it’s especially important if your goal is off-lead control. Though Happy Training, Happy Tails outlines the lesson “Come,” you can use your dog’s meals to create a positive association to the word. – Place your dog’s meal in your pocket or fanny pack. Either let your dog free in an enclosed yard or place her on a drag lead. Each time your dog returns to you, say “Come,” and then praise and reward her with a handful of her meal. Once your dog learns where her food stash is, she may Velcro to your side. Consider ways to encourage separation, such as throwing a toy or introducing another person or dog, or simply ignoring her until she loses interest. – Fill a treat cup with kibble and run away from your dog as you call out her name. Reward your togetherness, linking “Come” to receiving a reward and playing a fun game as well. As your dog quickly associates “Come” with being together, begin to say “Come” as your dog is in the process of running over to you. If you’re having trouble prompting your dog’s return, don’t call her repetitively or run at her in a huff. Instead, act like another dog, either kneeling to poke inquisitively at the ground, or by taking out a treat cup or favorite toy and pretending to reward yourself. Shouting is another example of miscommunication. Though a natural expression of human anger, this loud reaction (perceived as barking) can spell terror to a puppy/dog with low self-esteem. – Reflect on the situations that initiate fear reactions for your dog and use her meals or treats to create a positive association to each. – If your dog backs up when you reach down to hold/pet her, turn sideways and kneel down at her level avoiding all eye contact. Feed her handfuls of food as you caress the side of her head with your free hand. Also engage other family and friends to approach and pet her as you portion out her food. – Dogs often back away when approached with a leash or to be medicated. Teach your dog the directions “Sit” and “Wait” (see Communicating with Your Dog and Happy Training, Happy Tails) and link food to these directions. Practice simply approaching her, waiting to actually medicate or handle her until you’ve regained her trust. Regardless of their age or situation, a dog that is rescued, having been abandoned or in a shelter, can have emotional problems due to the experience. Some dogs act manic, but that behavior is simply a mask for their being emotionally out of control. Even the best shelter situations are jarring, often prompting defensiveness and confusion (see Understanding and Resolving Aggressive Behavior). Give your dog’s meal at the time of normal feeding to solidify your constant presence in her world and condition cooperative behavior. This approach goes a long way in shaping both her understanding of, and response to, your direction. If you have children, let them play a role in the reconditioning process. Place the treats/meal in a cup, and with the children, approach the dog when she is eating, resting on a mat, or chewing an appropriate toy. If she growls, stop immediately and call for help. Play training is essential with rescue dogs as the intensity of their former situation often overshadows their ability to have fun. Use treat cups to call your dog back and forth from one person to the next as you use her name. Hide from your dog and/or run away from her as you shake the cup — all the while rewarding and praising her. Many rescue dogs equate the directional tone used in training with past corrections or disapproval. As you teach your dog new directions like “Sit” and “Down,” lure her with her meal as described in Understanding and Resolving Aggressive Behavior; be generous with your praise, too. You can break down many learned behaviors, from “Come” and “Down” to agility sequences and tricks, into several separate actions, allowing you to teach each separately before linking them altogether. The direction “Down,” for example, can be broken into three sequences: looking down, moving the legs forward, and finally lowering the body into position. 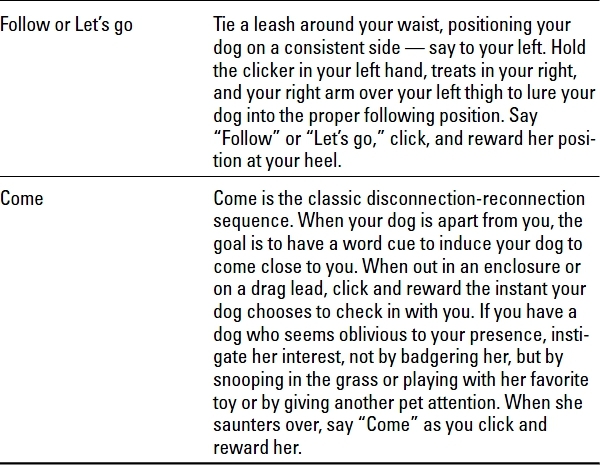 The direction “Come” also links three actions together: When a dog is called from a distance, she must respond to her name, leave the area and run toward the person, and, finally, slow down as she gets close and fully reconnects. Any sequential behavior can be taught step by step before linking the steps together. This technique is ideal for young puppies or for dogs who are unable or unwilling to concentrate on the overall request. Building on your dog’s success rate instantly lightens what can otherwise be a stressful situation. In addition, simply saying a direction as your dog repeats a behavior enables you to practice shaping techniques throughout the day. You may use food to practice luring. To lure your dog, simply think of the lure as attached to your dog’s nose by a short thread. Then consider her movements to discover how to maneuver the food to lure her into a specific position (see Table 10-4). When luring, move the reward very slowly. Jerky motions encourage jumping or moving and can confuse your dog. Though she may not catch on right away, she’ll focus on the goal when you repeat the luring motion. 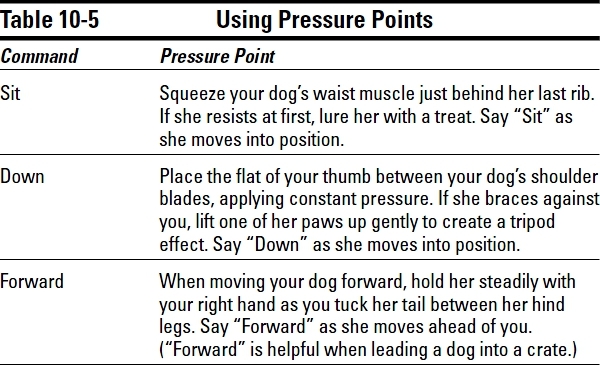 Your dog has many pressure points on her body that, when touched gently, will induce her into a specific position (see Table 10-5). Avoid manhandling or jerking your dog around as it is both unnecessary and hurtful. Modeling can refer to both behavior and training. An obvious example of negative modeling is the chaos that often ensues when visitors arrive. If you rise to your dog’s level of excitement, then you’re modeling her reaction. For an example of positive modeling, consider the same situation as you remain calm, only including your dog after she models you by calming down. Though it may take many repetitions to note an improvement, it will come. Modeling for training can be as goofy as lying down to encourage the same or as inclusive as using a well-trained dog to mirror the proper response to a new student. Stay calm in any situation that confuses, excites, or startles your dog. Though your interaction may be heartfelt, reassuring postures and tone often convey confusion. Stand tall as though nothing were out of the ordinary: Your dog will feel secure in your confidence and learn to mirror your reaction in all situations.